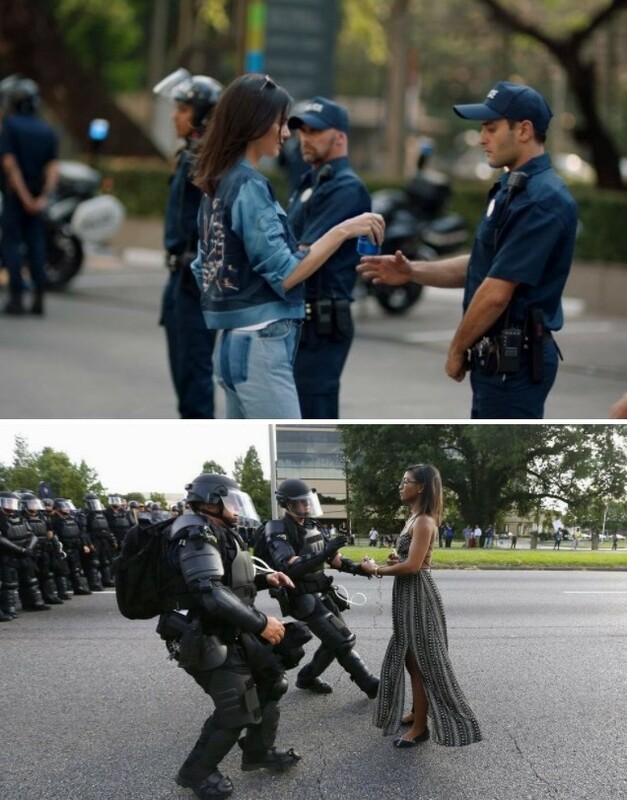 Pepsi has released its latest ad, featuring model Kendall Jenner, who ultimately spearheads the homogenous resistance to unite everyone with a cold can. So far, the advert has been trashed for being tasteless and trivialising several important movements. The ‘Live for Now’ commercial sees Jenner rip off her blonde wig and ditch a modeling job to join a protest. A crowd marches with banners that read with lukewarm slogans like ‘join the conversation’. There are shots of a guy playing a cello, and a woman in hijab making her own signs. As Jenner joins the protest, she approaches police officers and hands one a beverage. This moment in particular has been called out by some, for mirroring the now iconic image of Ieshia Evans during a Black Lives Matter protest; instead, it’s a privileged, rich, white model. As the officer cracks it open, the crowd cheers: somehow, this is a victory for social activism. The ad has been pretty much unanimously dragged as tone-deaf and performative. Protests are counter-culture, and many agree it isn’t the place for a corporation to co-opt the resistance, especially at a time when challenging the current political and social climate is so essential: people came together across the world for the women’s march, for Trayvon Martin and Black Lives Matter, to protest the Muslim ban and Trump’s continual joke executive orders. Check out some of the reactions to the ad from the Twittersphere below. that Pepsi ad is really dystopian. Disney-fies resistance. whitewashes and commodifies protest. wow there's a lot to unpack there. "Hold my wig, Keisha. I've got some liberating to do!"